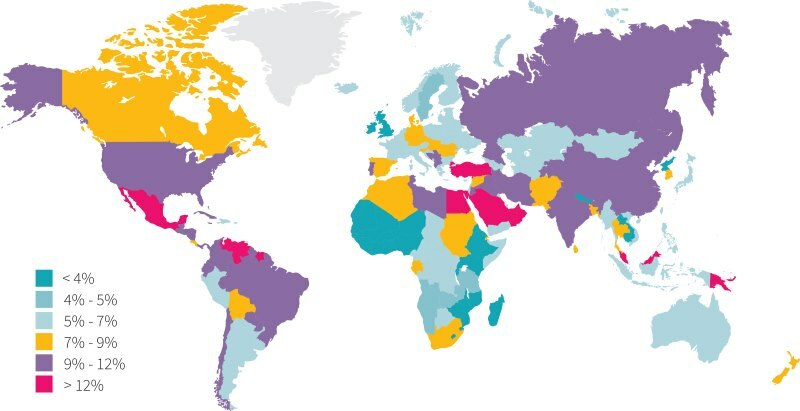 Type 2 diabetes is a worldwide problem, as Figure 1 shows. In 2014, the overall global prevalence of diabetes among adults was 8.5%. In North America, it was estimated to be 9.6%. Proper nutrition, maintaining a healthy bodyweight, and exercising can help reduce the risk for developing diabetes, while similar lifestyle habits and pharmaceutical interventions can help manage or treat the disease in people who have it. But is there a role for supplements in diabetes treatment or prevention? Cinnamon is primarily used in cooking, but in some traditions, the spice is used as medication for multiple ailments. In diabetes, cinnamon is thought to work by helping optimize glucose tolerance and lower insulin resistance, or by lowering systemic inflammation, which is also considered a risk factor for metabolic disease and diabetes. In vitro and in vivo evidence suggests that cinnamon has anti-inflammatory, antimicrobial, and insulin-sensitizing properties, all of which could theoretically help prevent and manage diabetes. However, much of the existing research has involved test tubes and animals. Existing research on the potential effects of cinnamon on glucose tolerance in humans is mixed. One of the first human trials to test this effect found that cinnamon supplementation improved blood lipids and glucose in people with diabetes. However, a 2007 study using similar methods was unable to replicate the original results; researchers found no effect of cinnamon supplementation on outcomes. In the study under review, researchers sought to add to the limited literature on the matter by examining the effects of cinnamon supplementation on adults with diabetes. By measuring biomarkers of glucose tolerance and insulin sensitivity as well as markers of antioxidant capacity and oxidative stress, the investigators attempted to measure any beneficial effects of cinnamon in both glucose management and systemic inflammation. Due to a growing worldwide prevalence of diabetes, researchers are interested in applications of natural foods like cinnamon to control blood sugar and curb inflammation. Current research exists in cells and animals showing that cinnamon can help manage diabetes and has anti-inflammatory properties, but more research in humans is still needed. In the study under review, researchers tested the effects of cinnamon supplementation in adults with diabetes. This was a double-blind, randomized controlled trial involving 44 adult men and women with type 2 diabetes. The participants were on the older end (about 57 years) and overweight (BMI of about 28) on average, but none were obese or had kidney disease, chronic inflammatory diseases, or heart disease. None of the participants had diabetes for more than eight years. The average HbA1c was around 10% and average fasting glucose was about 187 mg/dL (10.4 mmol/L). Researchers performed a power calculation to determine that they needed 40 participants, and enrolled 44 to account for any dropouts. Ultimately, 39 patients, 20 in the experimental group and 19 in the control group, completed the study. Importantly, researchers never reported their predicted effect size for their power calculation, nor did they specify what outcome they used to calculate the power. Enrolled patients were randomized to the experimental group, which received a capsule containing one gram of ground cinnamon (the type was not specified), or to the control group, which received a capsule of the same size, shape, color, and smell filled with microcrystalline cellulose. Participants from both groups were asked not to change their daily eating habits, but to take one of the capsules after each of their primary meals (breakfast, lunch, dinner) for eight weeks. Compliance was assessed via pill counts every four weeks. Before and after the eight-week intervention, the researchers measured hemoglobin A1c levels (HbA1c, a marker for average blood glucose level for approximately the previous three months), fasting plasma glucose (FPG), fasting insulin, total antioxidant capacity, carboxymethyl lysine (a measure of advanced glycation end-products, or AGEs, and oxidative stress), and malondialdehyde (MDA, another measure of oxidative stress). 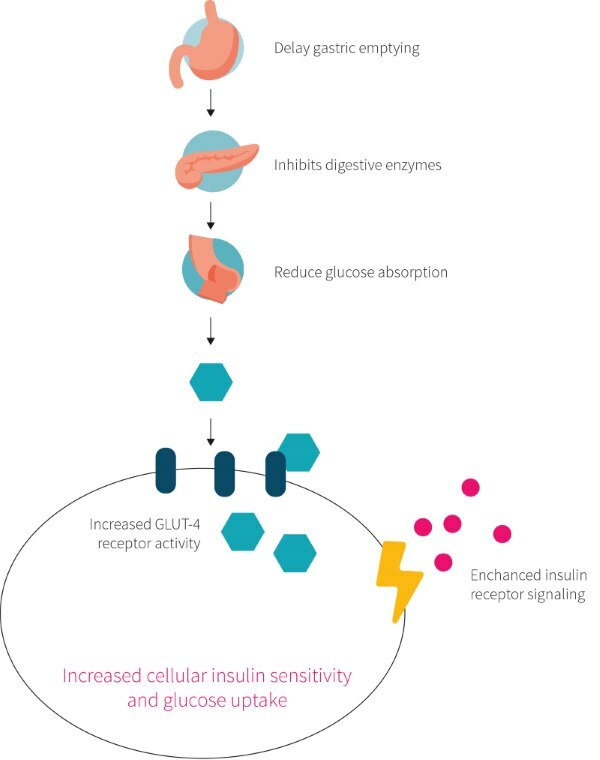 They used the FPG and fasting insulin values to also calculate insulin sensitivity using the homeostasis model assessment for insulin resistance (HOMA-IR). There was no mention of primary or secondary outcomes in the study. However, the study’s preregistration reports that carboxymethyl lysine, HbA1c, and fasting insulin are considered primary outcomes, along with many other outcomes not reported in this study. No corrections for multiple comparisons were made by the authors. In this randomized-controlled study, 44 eligible participants were divided into experimental and control groups. The experimental group took a one-gram cinnamon capsule three times daily for eight weeks, while the control group did the same with a placebo. Researchers collected numerous biomarkers, including HbA1c, FPG, fasting insulin, total antioxidant capacity, carboxymethyl lysine, and MDA at baseline and at the eight-week mark. Biomarker results were then compared within and between groups. There was no statistically significant difference between the cinnamon and placebo groups for any outcome over the course of the eight-week study. However, the cinnamon group had a -11.65 mg/dL decrease in FPG while the control group saw a mean 8.57 mg/dL increase. The between-group difference approached significance (p=0.06). Similarly, the average difference in MDA also approached significance (p=0.08) with the cinnamon group seeing a 0.00 μmol/L change and the placebo group seeing a 1.05 μmol/L increase. Overall, the study suggests that cinnamon may not have an effect on type 2 diabetes, at least in the short term. Unfortunately, these results are suggestive at best, since the study had multiple shortcomings, making it hard to be confident in any conclusion drawn from it at all. One major issue has to due with the study’s preregistration. There, the authors did not cleanly delineate between primary and secondary outcomes. The preregistration did technically specify these. The problem is that twelve primary and fourteen secondary ones were listed. Listing off so many primary outcomes somewhat defeats the purpose of having them in the first place. Thus, the results of this study should be taken as fairly preliminary and exploratory due to the large amount of variables measured. Another major problem with the study is its use of multiple comparisons. While there were possible promising trends for statistical significance seen for FPG and MDA levels, these become less promising in light of sheer amount of parameters measured. This problem is compounded when the lack of specification for a single, explicit primary outcome is taken into account. A third strike against the results of this study lies in how the paper itself was written. The authors reported that they performed a power calculation to see how many participants were needed in order to see an effect of a certain size. This would normally be a good thing, except that in this case, the authors did not state the effect size they expected to see. This is an essential part of any power calculation. When we did the math using the stated sample size they arrived at, we found that the authors would have had to assume an effect size of 0.91 in order to arrive at the number of participants they reported. This is a very large assumed effect. Thus, the null results found in this study don’t tell us much; they only rule out cinnamon having a massive effect. It’s quite possible that cinnamon could have a smaller, but still clinically relevant effect, and that this study simply wasn’t well-powered enough to see it. These three issues, taken together, imply that this paper unfortunately does not say much about cinnamon’s effects in people with diabetes at all. At best, it only rules out cinnamon having a large effect. Future studies should be more focused by specifying a single primary outcome, and would benefit from recruiting a large enough sample to be able to see medium or small effects. Even if the findings from this study are taken at face value (and they probably shouldn’t be), it’s worth emphasizing that they would only hold for the population enrolled in this study: people with overweight who are not meeting the standard glycemic target of an HbA1C level of less than 7% (recall that the participants’ average level was around 10%). The results of this study should not be extrapolated to other populations, such as people with obesity or who have more well-controlled diabetes. Several methodological and reporting issues with this study make it difficult to draw any strong conclusions from it concerning cinnamon supplementation’s effects in people with type 2 diabetes. At best, it rules out very large effects. Future studies should recruit more participants and focus on a single primary outcome. This study adds to other inconclusive literature on the effect of cinnamon supplementation in people with type 2 diabetes. A 2007 trial of one gram daily cinnamon supplementation completed by 58 participants with type 2 diabetes for three months found no significant differences in FPG, HbA1c, or fasting insulin levels. The current study had a similar design, included similar participants (many were on metformin in the 2007 group), but tripled the dosage of the cinnamon and shortened the testing period. Ultimately, the higher dosage did not change the outcome in the study under review, although, as discussed in the last section, its lack of results are far from definitive. However, a 2003 study that recruited 60 people with diabetes found significant declines in FPG over 40 days, with similar declines in FPG in experimental groups consuming either one, three, or six grams of supplemental cinnamon per day. This trial, however, included participants who were older and had significantly higher FPG than the groups in the 2007 or trial under review. This speaks to the possibility that cinnamon may have a greater effect in people with poorer blood glucose control or higher levels of oxidative stress. The 2003 study also noted that participants receiving cinnamon supplements showed significant improvements in blood lipids as well. However, repeated studies did not replicate the lipid-lowering effects seen in the trial. Once again, later studies were also done in populations with better diabetic and cholesterol control. Overall, there is not consistent evidence to suggest that cinnamon supplementation has a beneficial effect on cholesterol levels. In a 2012 Cochrane review, independent investigators assembled existing trials on cinnamon supplementation for diabetes to assess the quality of the literature. Of the trials done by the time of publication, researchers examining 10 RCTs found that risk of bias was “high or unclear” in eight of the 10 trials. Furthermore, the review did not address the possible effects of cinnamon on oxidative stress, but focused on traditional markers of diabetes including FPG, HbA1c, and insulin sensitivity. Based on these findings, the authors of the Cochrane report stated that cinnamon’s effects on FPG were inconclusive, but that there was no statistically significant effect of cinnamon on HbA1c. Though there is limited evidence that cinnamon affects fasting blood glucose or long-term measures of blood glucose levels like HbA1c, there is some trial evidence showing that cinnamon can delay gastric emptying and reduce serum glucose levels after a meal. This could play a role in the mechanism of cinnamon’s putative antidiabetic effects, as shown in Figure 2. Cinnamon-induced delayed gastric emptying has been seen in people with BMIs in both the normal and obese range. In both of these trials, participants were given cereal seasoned with six grams of cinnamon. One trial also found that providing 100 mL of cinnamon tea slightly lowered the total blood glucose response to an oral glucose tolerance test in nondiabetic adults. The current state of the science shows no definitive proof that cinnamon capsules will be effective in humans with diabetes, although the quality of the evidence to date is quite low. However, at least one trial showed benefits in people with higher FPG and HbA1c measurements, which suggests that cinnamon may be more beneficial in people with less well-controlled diabetes. What is carboxymethyl lysine (CML)? 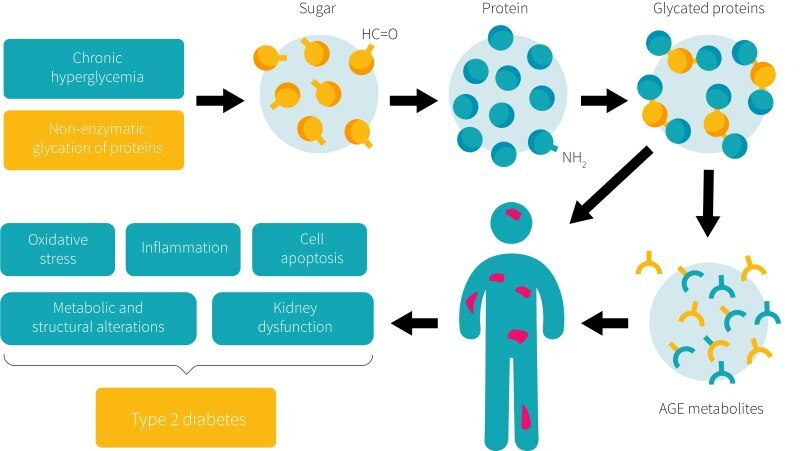 CML is a biomarker for advanced glycation end products (AGEs) which are associated with increased risks for diabetes or for diabetes complications. AGEs are proteins or lipids that become “glycated” — sugar becomes stuck to them. The basics of how AGEs form is laid out in Figure 3. These end products are formed during normal metabolism to some degree, but are exacerbated when sugar levels are abnormally high. One of these products is CML, which is known to accumulate faster in people with diabetes. Higher fasting levels of CML are associated with an increased incidence of diabetes. MDA is a marker for oxidative stress. It is an aldehyde that is formed when lipids, specifically polyunsaturated fatty acids, are oxidized. These can sometimes be referred to as advanced lipoxidation end products and are results of free radical events. People with type 2 diabetes have higher levels of MDA than healthy controls. Lowering systemic inflammation and blood sugar control are key components for preventing or managing type 2 diabetes. Cinnamon has been shown to have anti-inflammatory and insulin sensitizing properties in in vitro and animal studies, as well as lowering postprandial blood glucose in several small, human trials. RCTs attempting to show effects of cinnamon on glucose control in humans have found mixed results. In the study examined above, researchers found no effects from three grams of cinnamon supplementation on FPG, insulin resistance, or measures of oxidative stress compared to participants given a placebo. However, the study had significant limitations in design, reporting, and statistical analysis. Because of this, the study provides no strong evidence about cinnamon’s effects on type 2 diabetes. Further study is required. This page features 10 references. All factual claims are followed by specifically-applicable references. Click here to see the full set of references for this page.